Australia Post’s purpose is: Helping our people, customers and communities deliver a better future. Everyone, everywhere, everyday. Being safe everywhere: There’s nothing more important than our safety, health and wellbeing. Respecting everyone: We care about people and value diversity. Delighting our customers: A great customer experience creates a better future. Helping each other: We’re at our best when we work together. Australia Post has a rich history dating back to 1809 when a former convict, Isaac Nichols, was appointed to the role of Postmaster for New South Wales – using his own home to sort mail that was collected from sailing ships arriving in Sydney Harbour. The first Post Office, opened by Nichols soon after, was in George Street, Sydney. In 2008, after 200 years of growth, Australian letter volumes reached an all-time peak. In the eight years since, addressed letter volumes have declined by 43 per cent per letterbox. This shows how rapidly our traditional core business has shifted due to the emergence of digital communication and transactions. operating a monopoly – the domestic letters business – to competing in the global parcels and trusted eCommerce solutions markets. Headquartered in Melbourne, Australian Postal Corporation largely operates in Australia, with offices across the country. The Australia Post Group is one of the most trusted brands in Australia, employing more than 36,000 people across our integrated delivery, logistics, retail and eCommerce network. A self-funded government business enterprise, Australia Post has the Australian Government as its sole shareholder. The corporation does not receive any taxpayer funding and pays dividends to the Australian Government – more than $1.7 billion over the past decade. As required under the Australian Postal Corporation Act 1989, we continue to balance our commercial objectives with delivering our community service obligations. Any profit we earn is either used to pay a dividend to our shareholder or is reinvested in our assets and services so that we are equipped to meet the changing needs of our customers and the community. • The red highlights on this map, denote the location of our 11.5 million delivery points. This is the sixth year that we have incorporated sustainability reporting in our annual report. Prepared in accordance with legislative requirements, the Global Reporting Initiative (GRI) G4 Guidelines, Integrated Reporting <IR> and the principles set out in the United Nations Global Compact, our annual report includes our financial, social and environmental activities each year. Integrated reporting is aimed at facilitating integrated thinking into mainstream business practices. It is more forward-looking than traditional annual reporting, while not as specifically detailed as comprehensive sustainability reports. In actively considering the relationships between our enterprise and how we create value in our areas of impact – organised as ‘capitals’ – we can move towards publicly reporting the way we integrate our thinking and decision-making. The International Integrated Reporting <IR> Council Framework provides guiding principles that align with the GRI, the well-established global best practice sustainability framework. The content of this report has been guided by the annual report Steering Committee. The approach was endorsed by the Executive General Manager, Group Services, with final approval of the annual report by the Board. The information in this report applies to Australia Post within the reporting period, unless otherwise stated. Australia Post did not issue restatements of information provided in previous reports and there are no significant changes in the boundary or scope of this report in 2015/16. To determine the content and ensure we are reporting on what matters most to our stakeholders, we conduct an annual materiality assessment. This process is explained further in the report. As the world changes through the growth of digital technology, the way we live, learn and work has transformed. In looking to the long-term sustainability of our business, our future clearly depends on reshaping our business and continuing to create leading customer solutions. Satisfying our customers and anticipating what people need and expect from Australia Post will ensure that our business continues to grow and remain relevant and “Part of Tomorrow”. Our purpose is to help our people, customers and communities to deliver a better future. We know we achieve this most effectively when we have happy and engaged people working to design and deliver innovative solutions. We’ve worked hard to reform our letters services and to keep pace with everyone’s increasingly digital lives and the outlook is for an increase in social, mobile and online transformation. Our future, alongside our customers, is a story of growth and opportunity. maintaining our track record as a trusted service provider and responding to customer needs for identity, verification, banking, passport and payment services. Australia Post’s operations and our Part of Tomorrow strategy, in particular, create value for our customers and diverse stakeholders by drawing on all the six capitals outlined above and discussed throughout this report. Ultimately, being proudly Australian owned, we contribute to Australia’s economic growth and reinvest into the community to advance our enterprise purpose: Helping our people, customers, and communities deliver a better future. Our people: Working with over 50,000 employees, licensees and contractors nationally, empowering a skilled, diverse and engaged workforce. Our Part of Tomorrow strategy outlines how we advance our purpose, act and grow to deliver eCommerce experiences that customers value, differentiate ourselves from competitors, and make customers our greatest advocates. We know that global megatrends are impacting our operating environment: globalisation, digitisation, changing customer behaviours, changing expectations of the community and employees, and the effects of climate change to list a few. Increasingly, our value is founded on creating eCommerce solutions that meet the varying needs of customers. But we recognise the importance of measuring and monitoring our impacts in more than financial terms and of our role in creating social and environmental value. That’s why, in 2016, we refreshed our approach to Corporate Responsibility and launched our new strategy, “Everyone, Everywhere, Everyday”. Our approach is inspired by the notion of Creating Shared Value. “Everyone, Everywhere, Everyday” is all about being true to our enterprise purpose, and bringing it to life. 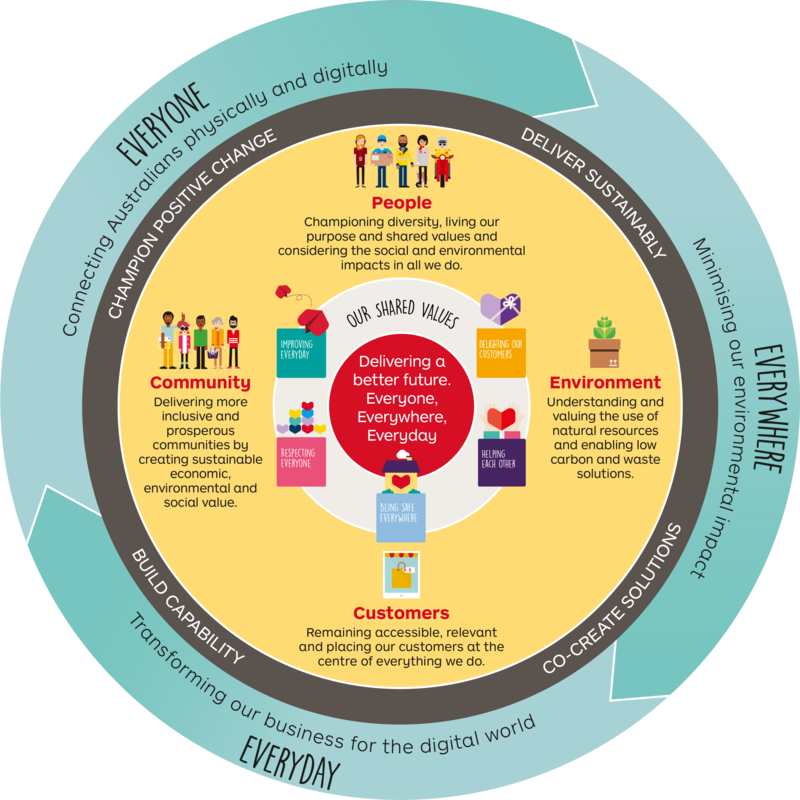 It is Australia Post’s roadmap to increase social and economic inclusion and wellbeing by connecting all Australians physically and digitally, to minimise our environmental impact throughout our value chain and to transform our own organisation so we meet the changing expectations of our customers and communities and help them prosper in a digital world. We implemented important reforms to the letters service in 2015/16, while continuing the transformation of Australia Post into a customer-led eCommerce company. With the Australian community continuing to shift to using digital channels for communicating and transacting, the amount of addressed letters posted this year was down 9.7 per cent on the previous year. This means that the volume of letters sent in Australia, annually, is now 43 per cent below our all-time “peak-mail” year, back in 2007/08. Given this rapid rate of digital disruption, one of our primary responsibilities involves managing the decline of letters carefully, while maintaining reliable, community-wide access to our services. To this end, we reached a landmark moment with the introduction of letter service reforms at the mid-point of this financial year. I would like to acknowledge the Federal Government for supporting the regulatory changes that were required to implement these vital reforms. The importance of those reforms to the long-term sustainability of our services cannot be under-estimated. In the short-term, letters reform was an important factor in our return to profitability this financial year. But, the reforms also give us the ability to maintain our nationwide services; the freedom to implement ongoing operational change; and the resources required to invest in our future as an eCommerce delivery company. As a service-based company that earns all of its profit from operating in fully competitive markets, our entire business is mobilising to put customers at the centre of everything we do. This was a particularly prominent theme in the second half of this year, as we established the role of a Chief Customer Officer with the responsibility of advocating for the customer, creating customer-led services and instilling a more customer-centric culture at Australia Post. As we seek to cement our position as Australia’s leading provider of eCommerce deliveries and services, our strategic initiatives are now all focused on supporting the specific needs of our customer segments. That involves creating safe and easy online shopping experiences for consumers; helping small business to go online and grow; powering eCommerce for all businesses; and helping corporations and government to digitise to improve their customer service. We continued to adapt our networks, develop new capabilities and offer new services to support the growth of online shopping and eCommerce. In June, we announced a strategic alliance with the global express delivery and logistics company, Aramex. We expect that this alliance will develop into a global business partnership that enables us to offer seamless cross-border logistics and delivery support for Australian businesses and consumers. Finally, I’d like to acknowledge the tremendous contribution made by my fellow directors, our CEO Ahmed Fahour, the management team, our employees, licensees and contractors. It’s a pleasure to lead this motivated, nationwide team, because they are so committed to delighting our customers – everyone, everywhere and everyday. John Stanhope AM – Chairman. This was an important turn-around year at Australia Post, as we reformed the letters service, continued to build our eCommerce offering for our customers – and returned to profit. This time last year, it was my grim duty to report that Australia Post had recorded its first full-year loss in more than 30 years. Therefore, I am delighted to report that the Australia Post Group returned to the black in 2015/16 – earning a modest profit before tax of $41 million. Total Group-wide revenue for the year was $6.56 billion (up 3.0 per cent on last year). The improvement in our financial position in 2015/16 was achieved on the back of two key factors: (1) the reform of the letters service and (2) growth in our business-to-consumer parcel deliveries. Our commitment to maintaining accessible and reliable services, nationwide, is evident in that we again met, or exceeded, all of the performance standards related to our community service obligations. Most significantly, we maintained 4,392 Post Offices across Australia (against a target of 4,000 access points) and we delivered 96.2 per cent of letters on time or early (well ahead of our 94 per cent target). Another pleasing aspect of this year’s performance was that we reduced our lost-time injury frequency rate (LTIFR) to 6.6, which equals our previous record low for the incidence of injuries in our workplaces. The reduction in injuries (our LTIFR is down 43 per cent over the past four years), is the result of our sustained focus on safety culture at all levels of the business. The ongoing and accelerating decline in the community’s use of letters meant that we had to reform the service to ensure it remained sustainable – and to prevent it from undermining the financial viability of the whole Group. We responded to this significant challenge by consulting widely with our many stakeholders and, then, we implemented a carefully crafted package of reforms on 4 January 2016. The reforms include the introduction of a two-speed letters service for consumers and an increase to the basic postage rate. But the broader reform package also involves discounted 60-cent stamps for the 5.7 million Australians with a concession card; commitments to maintain 4,000-plus Post Offices and five-day-a-week delivery; as well as job transition opportunities for our people, with no forced redundancies for anyone affected by the operational changes associated with letters service reforms. With these reforms in place, it means by next year we will have boosted total annual payments to licensed Post Office operators by $125 million in the space of four years. For a number of years now, Australia Post has been transforming into a parcel delivery and trusted service provider that enables all Australians to participate in eCommerce. That transition continued this year, as we expanded the capacity of our major parcel facilities and developed new solutions that make it easier for businesses to lodge with us – and for consumers to control final delivery. We also established a new business unit this year, called Trusted eCommerce Solutions, which is partnering with government agencies and corporations to co-create solutions for the secure, omni-channel delivery of services. There are now 4.1 million Australians registered on the MyPost platform. We added important new functionality to MyPost this year, including the ability for parcel recipients to direct us to “safe drop” their deliveries. The operational, cultural and service changes that we implemented this year will prove to be vital in setting up this great brand to be part of tomorrow. Those changes have involved a genuine commitment from everyone in our business – from my fellow directors and the senior executive team, through to our operational and customer-facing staff. I’d like to thank you all, and commend you on an incredible team effort. John Stanhope was appointed chairman of Australia Post in November 2012 (current term expires in November 2019), and has extensive experience in finance, treasury, risk management and assurance, investor relations and corporate security and investigations. Mr Stanhope is currently chairman of the Melbourne International Jazz Festival and the Bionics Institute, a director of AGL Energy Limited and Our Neighbourhood and Chancellor of Deakin University. He was previously chief financial officer and group managing director, finance of Telstra and an executive director of Telstra. Ahmed Fahour was appointed managing director and group chief executive officer of Australia Post in February 2010. He has held a number of senior executive positions within the finance and banking industries in Australia and overseas and was previously CEO of Citigroup (Australia and New Zealand) and National Australia Bank (Australia) and is the former chairman of Rip Curl Group. Mr Fahour is currently chairman of LaunchVic, Pro-Pac Packaging and Our Neighbourhood. Brendan Fleiter has been a member of the Australia Post board since October 2011, and was appointed deputy chairman in May 2013 (current term expires May 2017). Mr Fleiter is a former CEO of Crazy John’s Group and is a qualified lawyer with extensive retail and telecommunications business experience. Mr Fleiter is currently the chairman of Kennards Hire and Walnut Melbourne, deputy chair of Methodist Ladies’ College and chair of its Foundation and is a director of Volleyball Victoria, Our Neighbourhood, Australian Food Allergy Foundation, Godfreys Group and Interactive. Dominique Fisher was appointed to the Australia Post board in November 2014 (current term expires in November 2017), and has extensive business experience in the corporate area, including the commercialisation of new technologies. Ms Fisher is principal of EC Strategies, executive chairman of CareerLounge Pty Ltd and a non-executive director of LaunchVic. She has previously served as a director of Pacific Brands, Insurance Australia Group, NRMA, Opera House Trust and Prostate Cancer Foundation, as well as chairman of Sky Technologies and Circadian Technologies. Michael Byrne was appointed to the Australia Post board in October 2015 (current term expires in October 2018). Mr Byrne has extensive chief executive experience both in Australia and internationally, including in the areas of logistics and supply chains. He is the former CEO of Coates Hire, Linfox Australia and its Asian Subsidiaries and Westgate Holdings. Mr Byrne is also a foundation and current member of the Institute for Supply Chain and Logistics, Industry Advisory Board of Victoria University, and was previously a director of BevChain, Westgate Holdings and OzHarvest. Holly Kramer was appointed to the Australia Post board in October 2015 (current term expires in October 2018). Ms Kramer has more than 20 years’ experience in general management, marketing and sales for customer-focused organisations. Most recently she was CEO of apparel retailer Best & Less. Holly has also held senior executive and marketing roles with Pacific Brands, Telstra, eCorp and the Ford Motor Company. Ms Kramer is currently a director of Woolworths, AMP Limited, Nine Entertainment, Southern Phones, and the Alannah & Madeline Foundation. Bruce McIver was appointed to the Australia Post board in December 2015 (current term expires in December 2018). Mr McIver has strong business experience with expertise in transport and logistics in Australia and across the Asia Pacific region. He was most recently the president of the Liberal National Party of Queensland and was also a foundation director of the Australian Trucking Association and chairman of the Board of Asia Pacific Shipping Enterprises. Michael Ronaldson was appointed to the Australia Post board in May 2016 (current term expires in May 2019) and is a former member of the Australian Parliament, representing the Liberal Party. Mr Ronaldson was a Senator for the state of Victoria from July 2005 to February 2016, and previously served in the House of Representatives as the member for Ballarat from 1990 to 2001. He served as the Minister for Veterans’ Affairs, the Minister Assisting the Prime Minister for the Centenary of ANZAC, and the Special Minister of State. He was previously a director of Snowy Hydro Ltd and Berklee Pty Ltd, and was the CEO/Founder of Madison Public Affairs. Jan West was appointed to the Australia Post board in May 2016 (current term expires in May 2019) and has a very strong background in finance and audit across Australian and international listed and private companies, government agencies and community organisations. Mrs West is currently a director of Australian Red Cross, Dairy Australia, Neurosciences Victoria and Melbourne Forum. She has been president of the Institute of Chartered Accountants, a member of the Financial Reporting Council and a non-executive director of a number of commercial and not-for-profit entities, as well as being an audit partner of Deloitte. Susan Bitter was appointed to the Australia Post board in August 2012 and retired in August 2015. Peter Carne was appointed to the Australia Post board in December 2009 and retired in December 2015. Michael D’Ascenzo was appointed to the Australia Post board in May 2013 and retired in May 2016. Talal Yassine was appointed to the Australia Post board in August 2012 and retired in August 2015.